← Who Wants to Be a Road Shark? For me, kabobs is one of those recipes that I can’t imagine going an entire summer without making. There’s so many different variations of kabobs that can be made, and one of the great things about kabobs is how easy it is to meet a variety of taste buds for an entire group of people simply by varying the protein and/or vegetables placed onto the kabob skewers. Preston and I often make steak kabobs, but last week decided to mix things up after I saw an ad in a magazine featuring chorizo on kabob skewers. This led to Preston and I contemplating how to mix things up in the kitchen, and the idea for Shrimp and Chorizo Kabobs was born. Cut zucchini into slices and red pepper into chunks (they need to be large enough to stay on a kabob skewer). In a large mixing bowl, place the zucchini slices, red pepper chunks, garlic, basil, and oregano. Coat vegetables with olive oil (approximately 3 tablespoons). Add sea salt and pepper per taste preferences. Mix well, set aside, and let marinate for at least 15 minutes (the longer the better). Slice the chorizo into slices. Peel the shrimp if it hasn’t already been peeled. In a bowl mix the shrimp with olive oil (enough to coat, approximately 2 tablespoons) and sea salt and pepper to taste. Place chorizo, shrimp, and vegetables onto skewer sticks. Cook kabobs on the grill for about 10 minutes, turning halfway through cooking time. Serve kabobs alongside your favorite starch. I served them with brown rice. QOTD: What is your favorite combination of protein and vegetables to make kabobs with? This entry was posted in Food and tagged cooking, healthy eating, recipe, seafood. Bookmark the permalink. We have kabobs a lot here! My favorite is using pork tenderloin and pineapple with a teriyaki sauce! Ooo, I’m going to have to try these. Oooo this sounds like a great combo! I’ll have to grill this up next time I’m up at the lake! My kids and husband would love these! We love to grill in the summer. No dishes! One of the many great things about grilling! Sounds tasty. I love making kabobs. I am not a big fan of chorizo so I’d probably swap that out for chicken. That could very easily be done. That is a combo I would never have thought to try. Look great! We are vegetarians, so our “go to” protein for kabobs is either tofu or mushrooms. 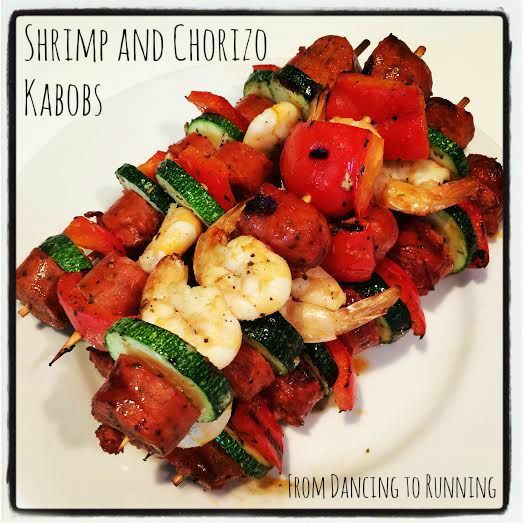 Both have that “meaty” texture that helps make the kabob! One of our favorite summer time foods as well! Kabobs are one of those perfect summer meals. Yum this looks very tasty! I love any kabobs with pineapple and chicken. Random but where do you like to purchase chorizo from/ what’s a good brand? I buy our chorizo from Wegman’s. I bet this is delicious! I love chorizo, although I haven’t had it in a long time. Looks yummy! I love shrimp and I love chorizo! This looks delicious! Def gonna try for my next BBQ!